Thanks for working on this Chris! I am not sure the password reset works properly. Attached is a screenshot of it giving odd errors. This was on Firefox 3.6. > All edits to bugzilla reports on our old system (http://bugzilla.open-bio.org/) are now disabled and the system is now read-only. Any new bugs and comments to old ones should be reported on the new Redmine server. 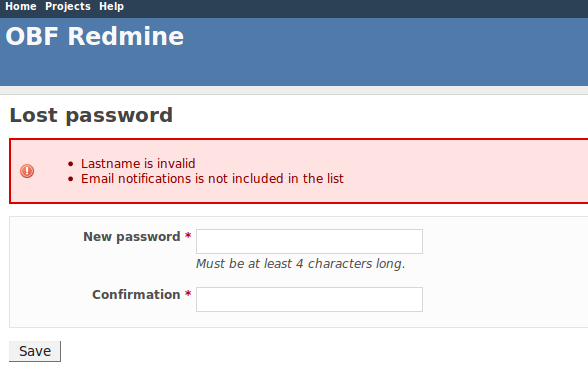 > 1) When logging in (http://redmine.open-bio.org/login), click on the 'Lost password' link. You will be prompted for your email address (this should be the same as your bugzilla login). An new email will be sent out containing directions for resetting your password and logging in. > 2) It is possible the above may be automatically detected as spam. If the above doesn't work or the reset email isn't received within a day, contact support at helpdesk.open-bio.org to receive your new password. > Also, note that Redmine has a different syntax for those who want to add links to their reports; see http://www.redmine.org/projects/redmine/wiki/RedmineTextFormatting. > Let us know if you have any questions.